We’re fully back into the swing of the school year. Last night was back-to-school night. We met our son’s teachers and got a sense of what’s in store. I think it’s going to be a great year, but intense. Our youngest son is a senior with lots of challenging classes plus college applications. And he’ll be in the high school marathon club again this year, which means his appetite will be turbo-charged even beyond that of a typical ravenous teenage boy. Gotta gear up with some great weeknight dinner recipes that satisfy and please the whole family – even the hungriest ones. This could be described as a Mexican Lasagna: corn, black beans, tomatoes, canned chilies layered between corn tortillas and cheese. It’s gluten-free and vegetarian, but it’s also delicious with added sautéed ground turkey or beef, if you like. Slice and serve with salsa and sour cream or plain yogurt – sometimes I make rice on the side. 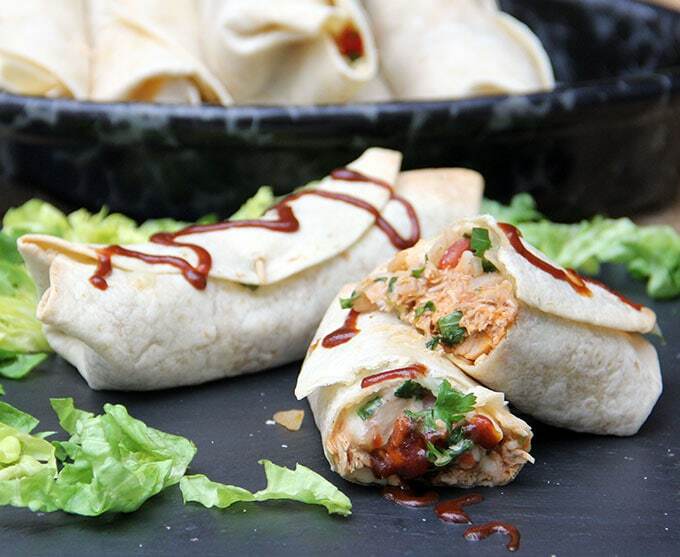 Shredded chicken (use rotisserie for a super fast version) tossed with your favorite barbecue sauce – mixed with onions, tomatoes, cilantro and shredded cheese – rolled up in flour tortillas and baked until the cheese melts. I make these by the dozen and freeze some for another night or for quick, microwavable after school snacks. 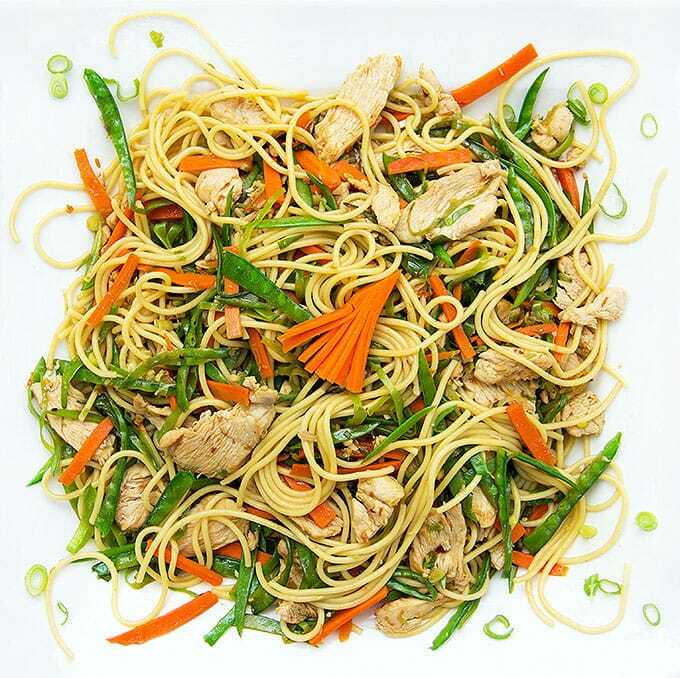 A quick satisfying Asian stir-fry with chicken, vegetables and noodles. A mild, beautifully-spiced curry that’s quick to make and family-friendly. 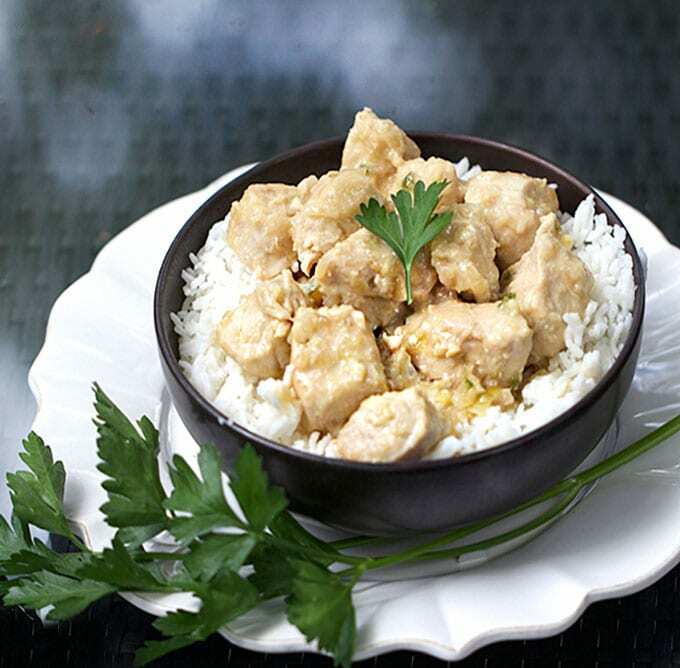 Delicious over fluffy white rice. Just one note about the sausage, onions, potatoes recipe – it’s extremely flexible. 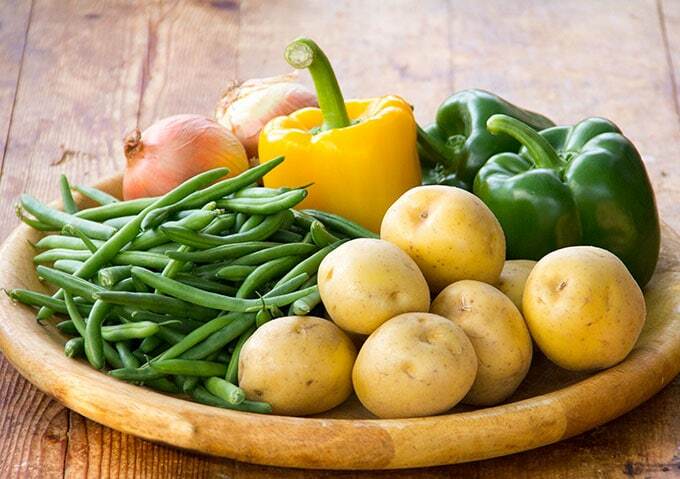 I developed this version with green and yellow peppers and green beans, for the Idaho potato commission. But I will often vary the types of vegetables I use – sometimes it’s red peppers (iPhone photo below), sometimes yellow or green. I also love this dish with sautéd sliced zucchini in place of green beans. I hope your fall is getting off to a great start! 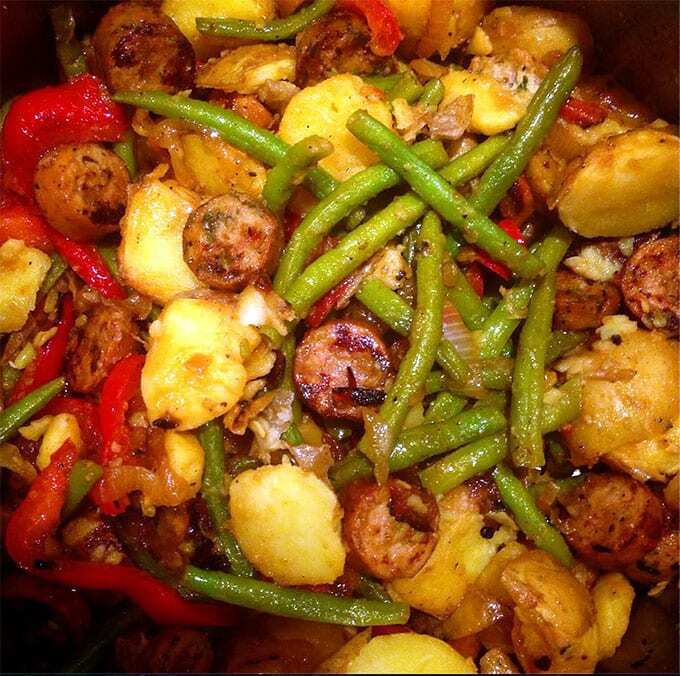 Here’s the recipe for Sausages, Onions, Potatoes, Peppers and Green Beans. If you try this recipe I hope you’ll come back to leave a rating and a comment. I’d love to know what you think! 2 1/2 pounds Idaho® Yukon Gold or Yellow Finn potatoes, scrubbed, cut into bite-sized chunks. Put the potatoes into a large pot, and cover with water by 2 inches. Stir in a teaspoon of salt. Set the pot over high heat. As soon as it comes to a boil, lower to a gentle boil and set your timer for 10 minutes, until potatoes are cooked but not falling apart. Drain and set aside. Put an additional tablespoon of oil in the skillet. Add the onions and peppers and cook, stirring occasionally, until they are softened and browned in spots, about 7 minutes. Remove from heat but keep on the stove. Sprinkle with 1 teaspoon of salt and 1/4 teaspoon pepper. Fill a medium pot halfway with water and bring to a boil. Drop the green beans in to blanch them. Once the water returns to boil, set the timer for 2 minutes. Drain and plunge beans into cold water to stop the cooking process. Drain and set aside. 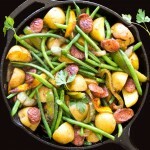 Add the sausages, green beans and potatoes to the skillet with the onions and peppers. Drizzle 3 tablespoons olive oil and pomegranate molasses (or balsamic) on top. Season with 1 teaspoon salt and ¾ teaspoon pepper. Toss everything gently to combine, over a medium flame, until heated through. Season, to taste, with salt and pepper. Divide among 5 bowls or plates. Enjoy! I found this recipe by googling sausage, pepper, green beans b/c that is what I had on hand. I used a package of Trader Joe’s chicken jalapeno sausage, I had one yellow pepper a red onion and a bag of green beans. I used balsamic vinegar…never heard of pomegranate molasses! It’s delicious! Caramelized onions with fresh green beans, quartered red potatoes and smoked sausage is the staple comfort food of summer for Hoosiers. 4 sausages for a total of 12 ounces? So four, three ounce sausages? HELP! All I get when on the page for this recipe (that I’ve made and loved previously) is 2 photos of the dish–but no recipe in sight. What’s up? What am I missing?? Renee, I just checked and the recipe is still here. Try clearing your browser cache. Do you know how to do that? Please let me know if you’re still having trouble! oh Lisa, I’m an idiot! I just didn’t page down far enough, duh! But now I have and we will be enjoying the yumminess soon. I’m so glad Renee! I was worried. Enjoy!! So good Lisa. No leftovers! Glad to hear it Carol! Lisa this dish looks amazing! I love a good hearty, one skillet meal. I don’t have pomegranate molasses but now I’m going to be on the hunt because that sounds awesome. Thanks for the great recipe! What a great weeknight dinner – I love the flavors going on and the fact that my whole family would go crazy for it!